Welcome to North Myrtle Beach, a hidden treasure on the coast of South Carolina. 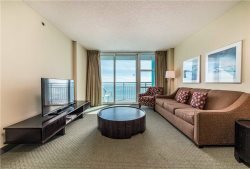 Part of the 60-mile stretch of beach known as the Grand Strand, North Myrtle Beach is a favorite family vacation destination, offering beautiful white sandy beaches, warm hospitality, and unsurpassed shopping. With an abundance of dining and entertainment, along with some of the country's best golf courses, this area is truly one of a kind. Among North Myrtle Beach's four distinct oceanfront communities, there is something for everyone. The Grand Strand averages of 219 sunny days each year and has pleasant mild temperatures, making this a year-round destination. The natural untouched beauty and the fun, family atmosphere of North Myrtle Beach make it stand out among other destinations along the Grand Strand. In this peaceful getaway, you'll find quaint beach cottages, luxurious oceanfront homes, condominiums and small family owned motels. North Myrtle Beach also offers something to keep every member of the family busy. Whether parasailing, jet skiing, boating, bike riding, or simply relaxing to the sound of ocean waves, there is always something fun to do. The Grand Strand is often called a golfer's paradise, as there are over 100 golf courses and more than four million rounds of golf played here each year. Famous golfers and architects such as Arnold Palmer, Jack Nicklaus, Pete Dye, and Tom Fazio have all designed courses in the area. Golf enthusiasts from across the country make North Myrtle Beach a golf destination year after year. North Myrtle Beach also offers some of the best fishing along the East Coast. Several fishing piers dot the coastline, offering fishing for the entire family. For the more serious fisherman, deep sea charters to the Gulf Stream are also offered from the docks of nearby Little River, SC. Once you spend some time on our beaches and interact with our friendly locals, you will certainly feel right at home. Many frequent vacationers are choosing to make North Myrtle Beach their year round residence, and who could blame them! If, after visiting, you love the area as much as we do, give Ocean Drive Beach Rentals a call — we will be more than happy to help you find the perfect home or condo or provide you with more information about the area. There are boundless activities in North Myrtle Beach, SC. From deep-sea fishing to amusement parks, you`ll find something for everyone on your coastal Carolina vacation! We put together some of our locally recommended things to do in the area. It`s worth planning a vacation to North Myrtle Beach, SC just to see the area`s attractions! From famous concert halls to botanical gardens, explore some of the area`s most interesting places. If you love seafood, you`re going to love North Myrtle Beach. The coastal Carolina town has a booming dining scene. Local restaurants, many of which are family-style, serve everything from fresh fish to authentic Italian cuisine. Those who have been visiting for many years know that North Myrtle Beach features an endless amount of live entertainment. Our year round theatre shows rival Broadway, and live bands play in nearly every local bar and restaurant. North Myrtle Beach is even home to a House of Blues venue, where big name artists, such as Britney Spears, Hootie and the Blowfish, and B.B. King, have all come to perform sold out concerts. Beach Music is particularly popular in North Myrtle Beach. In fact, it began several years ago along Main Street and Ocean Drive. Many of the bars and clubs in this area pay homage to Beach Music with nightly live bands and festivals, such as the seasonal S.O.S Migrations. Schedule a trip to the beach during Fall or Spring to see what the hype is all about surrounding Beach Music. Find out what is going on during your stay in Myrtle Beach! Great concerts, festivals, holiday events and sports. With all the great fishing options in our area, you can make a trip out of nothing but freshwater, pier, and deep sea fishing. The Cherry Grove channels fills with tidewater and brings in several species of saltwater fish from the ocean. The bait and tackle shop on the Cherry Grove pier can rent poles and other equipment for a full day of pier fishing. Or, go offshore for a deep sea fishing adventure of a lifetime! Either way you`ll have a great time reeling in a catch you can bring back to your rental for a fresh seafood dinner. You may be vacationing in one of the greatest beach destinations in the country, but even with the amazing attractions everywhere, a simple movie night with the family is exactly what you need. Summer blockbusters will entertain your whole group while being a easier on your wallet than some of the other high-priced activities in the area. Here are the movie theaters in the Myrtle Beach area. Make your Carolina beach vacation a breeze with local beach rental services! We recommend the following companies for all your beach needs. You can rent beach chairs, umbrellas, high chairs - even beach toys! Too much sun from all the beach activity while on your family vacation? Take a break and visit one of the many malls, outdoor factory outlets, and specialty shops that thrive in North Myrtle Beach. Find all the latest fashions, fads, and electronics at popular name-brand stores. The Market Common, in south Myrtle, boasts a unique urban atmosphere with neat stores and loft living. Beachwear stores can be found on nearly every street corner in North Myrtle Beach and surrounding coastal towns along the Grand Strand. These are perfect places to grab a souvenir or everyday item that you may have forgotten to pack. Most of the time, beachwear stores offer deep discounts on t-shirts, sand buckets, beach chairs, and other beach equipment. Stop in and you may find that one unique gift that you can`t find anywhere else. North Myrtle Beach has a selection of great speciality stores you won`t find anywhere else! Pick up classic records, local bottles of wine, or unique beach accessories - and always have something through which you can remember your North Myrtle Beach vacation! From pirate adventures to action-packed jousting tournaments, the themed restaurants in the Myrtle Beach area will thrill your family while they feast on delicious multi-course meals. Make one of these fun experiences part of your vacation!